Friedrich Eichiner will celebrate his 25th anniversary as a BMW employee next year and his fifth anniversary as a member of the automaker's management board. He arrived at the company in 1987 after earning his doctorate in business management from Ludwig-Maximilians-Universitaet in Munich. He held a number of jobs in leading posts in logistics, production and sales before being promoted to director of corporate planning in 2002. BMW CEO Norbert Reithofer picked the Bavarian to be the board member for corporate and brand development in 2007. 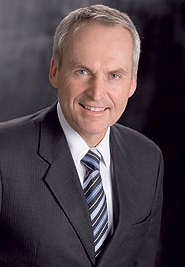 Eichiner, 55, was named BMW CFO in December 2008. BMW Group is seeing positive results from the strategic realignment it initiated in late 2007. In the first half of 2011, the Bavarian premium carmaker posted a profit margin of 13.3 percent, compared with an 11.8 percent margin at Audi and 10.0 percent at Daimler. The automaker's new-car sales were up 19.7 percent to 833,366 units in the half, causing BMW to revise upward its full-year forecast. The company aims to sell more than 1.6 million BMW, Mini and Rolls-Royce models in 2011, which would be a new record. BMW Chief Financial Officer Friedrich Eichiner expects unit sales and profits to keep improving. He explained how this will happen in an interview with Automotive News Europe Editor-in-Chief Harald Hamprecht. BMW is the No. 1 premium carmaker based on unit sales and profit margin. Can you defend this position until 2020? Yes, I am firmly convinced that we will remain No. 1 in the premium segment worldwide. We have the strongest reputation in the premium segment worldwide. As early as 2007, we set the right course for success with our strategic realignment. You can see that in our financial results as well. For all of 2011, we are expecting a sales increase to more than 1.6 million vehicles. That represents growth of more than 10 percent compared with last year. And we are striving for an EBIT margin of more than 10 percent in the automotive segment for 2011. How will these figures develop over time? In the ensuing years, we want to reach our goal of a sustained profit margin of 8 percent to 10 percent within the group, assuming that the economic trend will basically be normal. In addition, we are on the brink of taking electro-mobility to a new level. Plus, the development of a front-wheel-drive architecture across brands in the premium small-car segment will help us improve ourprofitability even more. Will you make with the first generation BMW i3 and i8 electric cars? Yes, we invariably only plan vehicles with margins that correspond to our internal guidelines. Naturally, we have significant advance expenditures. Nonetheless, both models will make positive contributions to our operating income. This of course depends on the demand for electric vehicles in the market. By 2020, a global market share between 5 percent and 15 percent is expected for electric vehicles, including plug-in hybrids. In any case, we have made conservative production runs part of our early planning. What is the output forecast? It is too early to talk about volumes. Will your r&d investments increase? Despite comprehensive investments for the future, in new products, technologies and drive systems, the share of r&d in 2011 will be within the target corridor of 5 percent to 5.5 percent, thanks to efficient development processes and the strong growth we expect in revenue. In addition, the share of investment will be below 7 percent of revenue by the end of the year due to rising revenues. How much are you spending on one-off expenditures? They are comparable with a newly developed model line. Don't forget that these new technologies and materials are producing savings as well. Just look at the carbon technology: You don't need a body shell, welding robots or a paint shop. Instead, carbon involves weaving. Approaches from the textile industry are used. That reduces investments in facilities. What new sales channels will you establish for BMW i? We will take new approaches here as well. But we'll still need the dealer. The business is local, so service will always take place locally. That's why we will continue to need adequate dealer network coverage in the age of electro-mobility. At first, we will focus on metropolitan areas in the sale of electric vehicles because we expect the highest demand there and the service for the new models naturally requires dealer investment: high-voltage and carbon fiber technologies demand different tools and training. What are your greatest competitive advantages compared with Audi und Mercedes-Benz? If the BMW i3 is run on electricity from renewable sources, the CO2 balance across the whole value chain is more than 50 percent better than that of a very efficient vehicle with an internal combustion engine. That is unique in the auto industry. What will happen to the price of carbon? In the course of the product life cycle, we want to drive the cost of carbon to the level of aluminum. Naturally, volumes are the key here. Will you work closely in this area with Volkswagen, the second-largest shareholder in carbon supplier SGL after BMW shareholder Susanne Klatten? Every manufacturer is welcome to buy carbon from SGL. We see no disadvantage to this because we only produce the precursor at the SGL joint venture. The expertise to manufacture carbon fiber components is and will remain the property of BMW and is being used initially at BMW's Landshut factory. In any case, German manufacturers have the good sense not to be directly involved with suppliers. Closed circles do not really promote the supplier's innovative power and the quick attainment of economies of scale. We prefer independent suppliers. Will you expand your cooperation with PSA? Our hybrid joint venture includes the development and production of basic components and modules for powertrains, storage media, batteries and control electronics. The usage varies; however, we will tend to use the models at the higher end of the performance spectrum, and PSA at the lower end. It makes a great deal of sense to share one-off expenses and risks because we don't compete directly with one another and we will differentiate the modules sufficiently. In no way are we risking the dilution of the brands. Europe continues to be your core market with 50 percent of global sales. How are you positioned elsewhere? China's share of sales came to 14.5 percent in the first half the year. North America contributed just under one-fifth; Germany more than 17 percent. We are maintaining a globally balanced market distribution. We are also positioned well in all the other high-growth markets, that is, Brazil, Russia, India, Korea and Turkey. What are the next steps in the United States? This year, for the first time, we will be the overall leader in the premium segment, after being the leading European premium manufacturer there. We want to defend this position. The U.S. is the largest premium market in the world and will be immensely important to us strategically in the long term. Nonetheless, we will also pay attention to a globally balanced sales ratio in the future. We will soon launch our new BMW 1 series. That will give us a push worldwide. Do you also see warning signs for the global market? All in all, we are optimistic but see certain risks and expect growing volatility. The challenges relating to the excessive indebtedness of some national budgets and possible pressure on consumption from rising taxes and higher inflation could lead to more volatile trends. The global stock exchanges are already exhibiting this. At the moment, we are seeing a number of difficult situations, not just in Greece but in Spain and Italy as well. How dangerous are the U.S. and Japanese premium brands to you? We are rather relaxed about this from a global standpoint. We have built up a reputation over nearly 100 years. Any competitor has to earn this first.